The Mido Commander is one of the most iconic Mido models ever produced, but originally, wasn’t even called the Commander. The launch of the Ocean Star line in 1959 introduced a solid single piece case where the movement was actually accessed through the crystal as opposed through the case back. This along with their Aquadura cork type crown sealing system made for great water resistance in the line. In more recent years, the design from the original Ocean Star became known as the Commander. 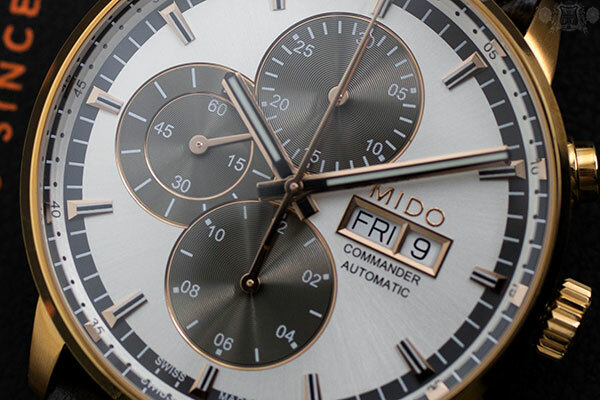 For the end of 2013, Mido introduced their first Chronograph in the series, know as the Commander II Chronograph. Today we review the M016.414.36.031.59. The M016.414.36.031.59 features a 42.5mm stainless steel case with rose gold PVD coating. The finish is mostly brushed, with a nice polish around the pieces thin bezel. The watch is just under 15mm thickness, but a contributing factor to that is its anti-reflective coated, domed sapphire crystal. In all, this piece weighs in at just over 1o5g. 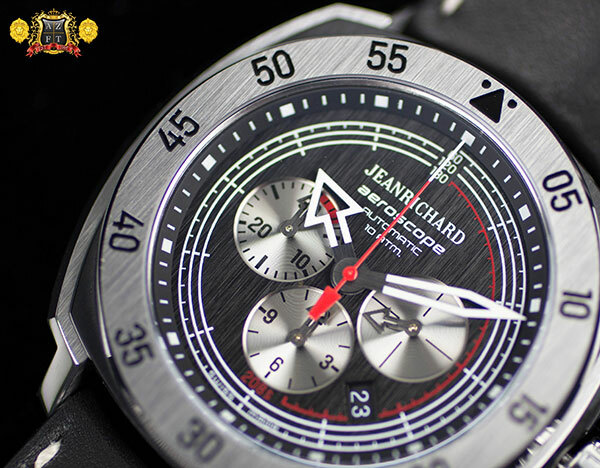 The dial on this model is incredibly attractive, using circular embossed anthracite colored over lapping sub dials. 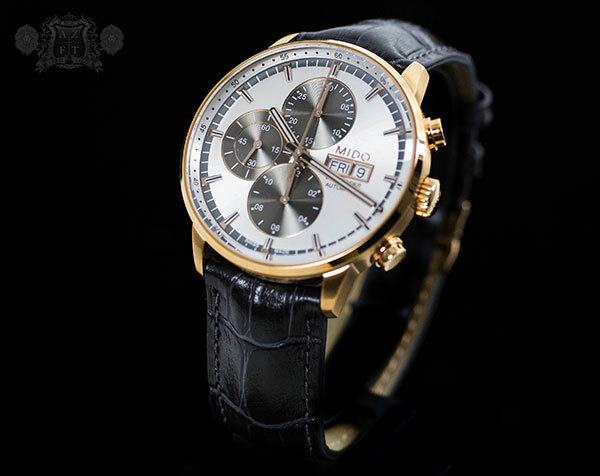 The chronograph’s hour counter is located at the 6:00, small continuously running seconds at 9:00, and chronograph minutes counter at 12:00. The dial itself is silver with a beautiful sunburst pattern and an anthracite track running around the outer edge of the dial. The baton shaped hands are rose gold and anthracite, with a nice blue luminova on the inside. The movement utilized in this Commander II is labeled as Mido Caliber 1320. This is a base of a Valjoux 7750 that displays day/date and chronograph features (as listed above), which was modified by Mido. 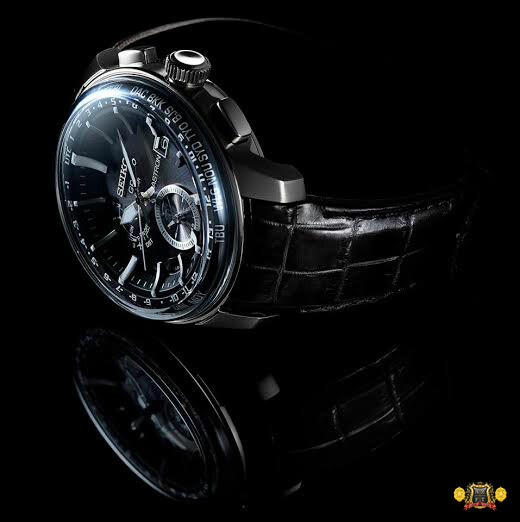 The movement has 25 jewels, 28,800 bph, 165 parts and over a 42 hour power reserve. The movement is extravagantly finished with perlage, blue screws and Geneva striping on the Mido branded rotor. Obviously, due the the transparent case back, this does not have the same exact case as the old Ocean Stars. 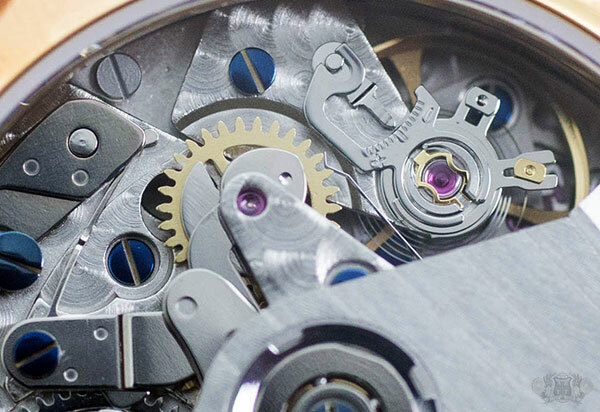 The balance wheel used is a glucydur, that also uses a Nivarox I hairspring. Nivarox is one of only a couple hairspring manufactures in the watch industry and is owned by Swatch Group, who also owns Mido, ETA and many, many other brands/manufactures. 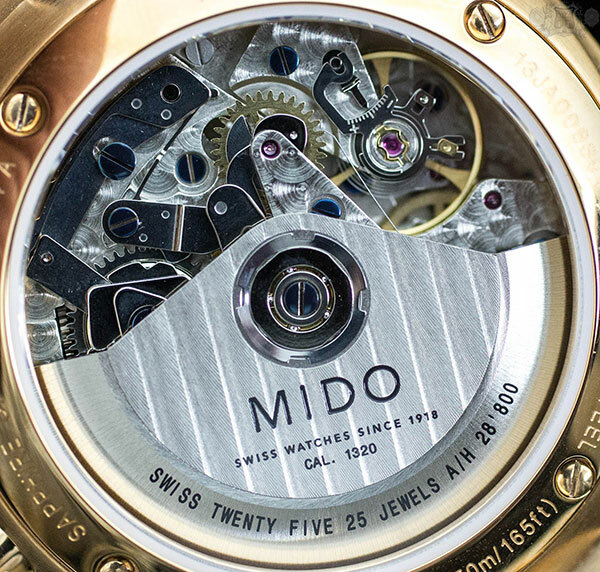 Mido definitely has an advantage being a part of Swatch Group as they have proven to be one of the highest values in the industry for a highly decorated, very well built ETA/Valjoux base movement. 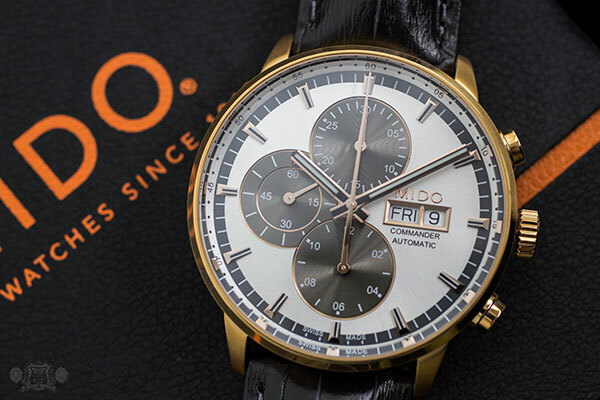 The new Mido Commander II Chronograph M016.414.36.031.59 retails for $2,000. As always, if you have any questions, please feel free to call us at 1-800-486-3996 or submit an inquiry through AZFineTime.com. The importance of time is something that can be truly under valued. On January 15th 2009, US Airways flight 1549 left LaGuardia Airport at 3:25pm headed for Charlotte, NC. The commercial flight carrying 150 passengers and 5 of the flight crew struck a flock of geese that were too close to avoid within about a minute and a half of take off, causing the loss of both engines power. The loss of thrust brought forth the realization that the plane could possibly crash in one of the highest populated areas in the world. At about 3,000 ft above the city, and descending rapidly, Captain Chesley “Sully” Sullenberger had to take control of the plane and start looking for places to land. At first, the thought was to return to LaGuardia, but that option was not possible. The next thought was landing at Teterboro Airport in NJ. This was also not an option. The only level and large enough place to possibly land at that point was the Hudson River. Captain Sullenberger reacted fast enough to decide to land the plane on the Hudson, and glided the aircraft ensuring the nose was up, and wings were level when landing the plane on the river. With the help of his Co-Pilot and crew, Captain Sullenberger successfully saved 155 lives. This feat was truly amazing in many ways, incredibly heroic, and an example of how time is precious. It was was only a mere 208 seconds from the time of the incident to their landing on the Hudson. 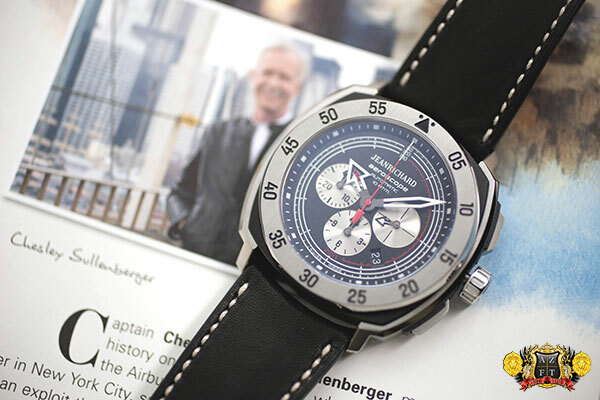 On the 5th anniversary of the “Miracle on the Hudson”, JEANRICHARD and Captain Sullenberger launched a limited edition timepiece commemorating Flight 1549 and the fact it landed on the Hudson, with no loss of life. The “Philosophies of Life” that Captain Sullenberger and JEANRICHARD share are what brought them together. Striving for excellence and staying vigilant are two of these traits that especially reflect these philosophies of life, but also modesty and precision. Captain Sullenberger was a part of the US Air Force, an aviation expert and accident investigator. That as well as nearly 40 years of flying experience contributed to the heroic act. The calm minded reaction of Captain Sully and his crew were also a big part of this and one of his incredibly modest quotes “We were simply doing the jobs we were trained to do”, makes you appreciate it even more. Not an athlete, not a celebrity, but an average guy who did something unbelievably extraordinary. A true hero. 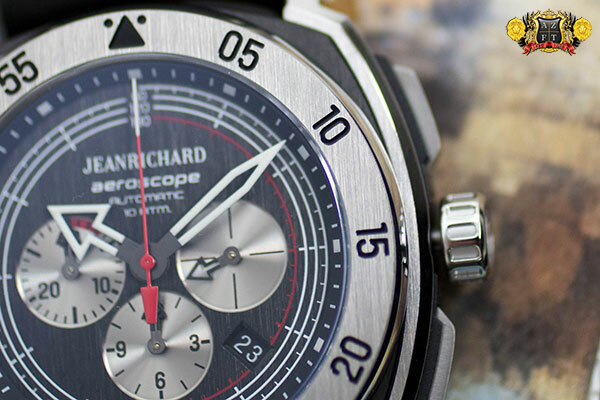 The new 208 Seconds Limited Edition JEANRICHARD Aeroscope has highlighted the 208 seconds it took to save 155 live with red accents on both the chronograph minute’s counter and the inner dial track. There are 3 white tracks on the inner dial that do a full 60 second lap around the dial, and a red track for the last 28 seconds displayed on the dial. This totals up to the 208 seconds without even having to look at the sub dial. 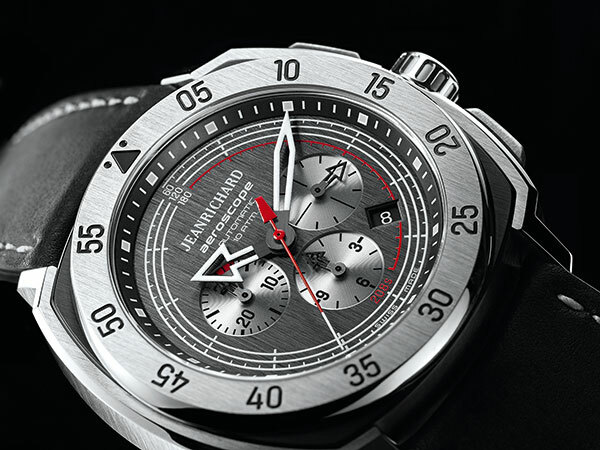 The chronographs minute counter is highlighted in red for the first 3 minutes and with the red track showing 28 seconds, totals back up to 208 seconds. These obviously pay tribute to the flight, but also add for great detail on its beautiful black vertical satin finished dial. 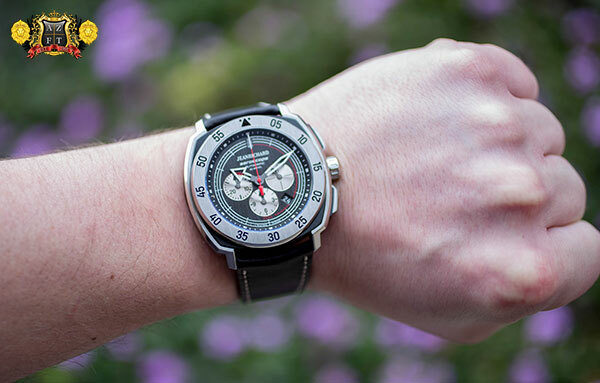 The silver embossed chronograph and seconds counter sub dials also contribute a nice contrast, and easy legibility. The 44mm cushion shaped titanium case is also exquisitely finished using a combination of vertical satin finish as well as an elegant high polish. 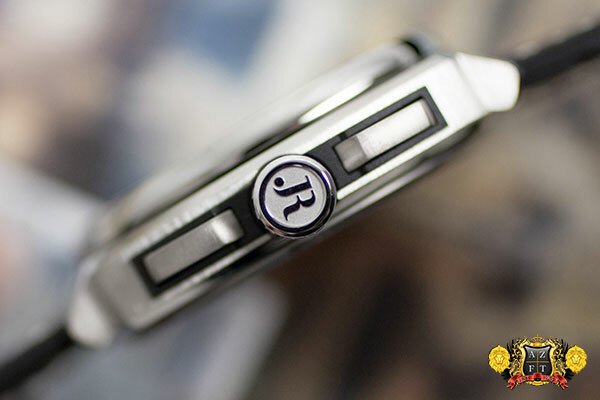 This truly gives a great feel for the quality and craftsmanship that goes into the JR brand. The other intriguing attribute on this piece is its inner cushion shaped case with DLC finish. The case side inserts that surround the DLC portion are in titanium silver finish contributing an awesome look for the timepiece. The sticker crown is branded with the JR logo and has a colosseum type design on the sides. The chronographs titanium pushers are surrounded by carbon fiber composite, giving a unique and firm feel when operating. All Aeroscope’s are 100m water resistant, and this piece is no exception. 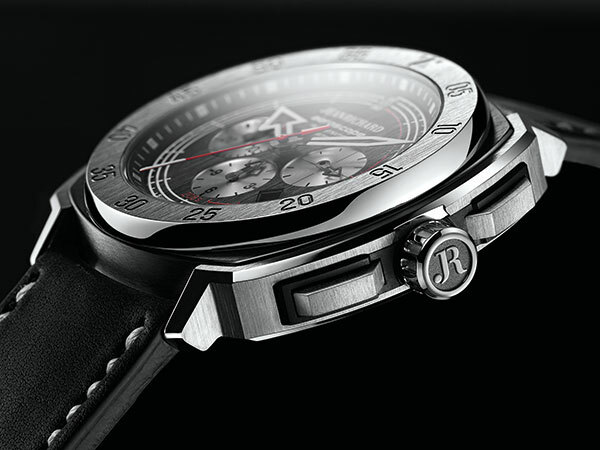 The movement utilized is the JR66 self-winding chronograph. The movement starts as a base Sellita SW300-1 for time keeping, which is then modified by JEANRICHARD, and a Dubois Depraz chrongraph module piggy backing the base. This caliber has 43 jewels, 28,800bph, and a minimal of 42 hour power reserve. The display is quite simple and easy to read with centralized luminescent skeleton hands for hours and minutes, red with luminescent tipped centralized chronograph seconds, sub dial at 3:00 for actual seconds, chronograph hours displayed at 6:00, and chronograph minutes at 9:00. All of the sub dials hands are black and skeletonized. With closed case back, the 208 Seconds Limited Edition is engraved with individual serial number out of 208 pieces made. The strap is a black Barenia calfskin strap, with white contrast stitching and dual push button deployment clasp. 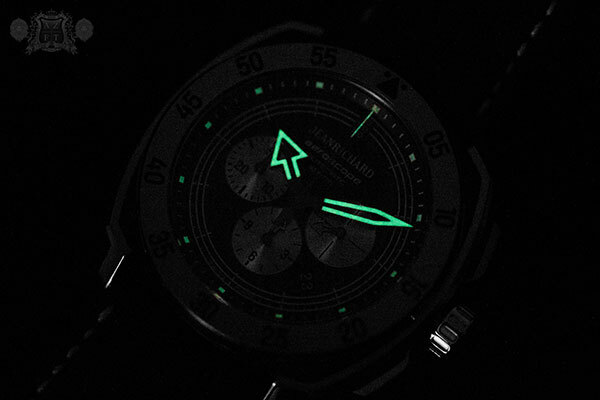 The luminova is not only on the centralized hands as mentioned previously, but also each index has a small square of lume found on the chapter ring. 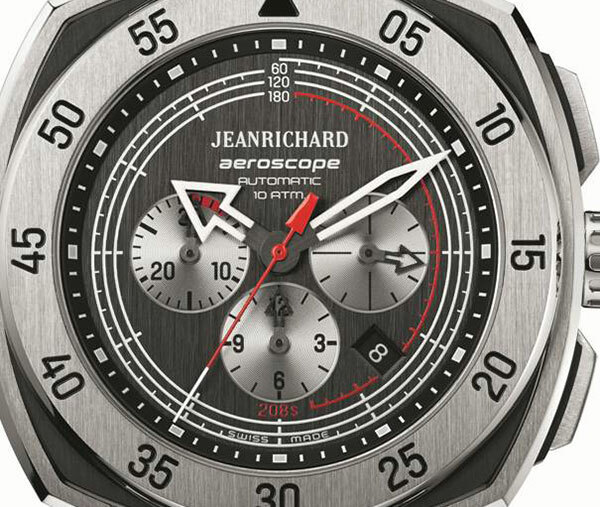 The JEANRICHARD Aeroscope 208 Seconds Limited Edition 60650-21O601-HD60 retails for $5,400. Part of the proceeds of the watch will go to The American Red Cross and The Rory Staunton Foundation, two of Captain Sullenberger’s philanthropic endeavors. As always, if you have any questions, please feel free to call us at 1-800-486-3996 or submit an inquiry through AZFineTime.com. 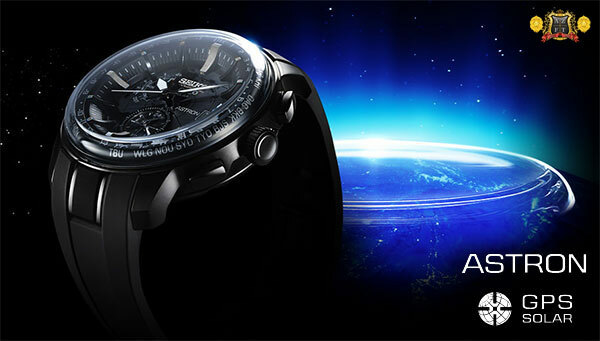 At the beginning of Sept. 2013, Seiko Japan had announced a new design for the Seiko Astron GPS series. The launch of the new “Stratosphere” design was something we could not confirm whether or not would be available to the US market, until now. 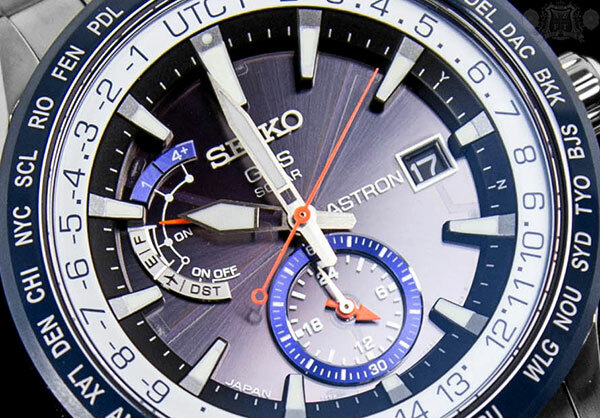 The Seiko Astron GPS Stratosphere series is officially coming to the US, in 4 different variations. 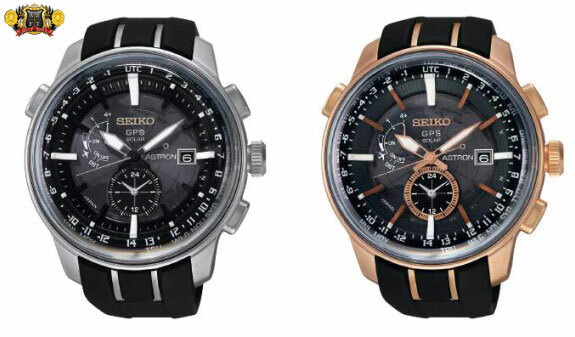 The 1st 2 pieces in the series are models SAST031 (left) which is a stainless steel case with Seiko’s extra strength silicone strap retailing for $2,500, and SAST032 (right) which is also stainless steel, but with rose gold plating, also on the extra strength silicone retailing at $2,600. Both of these models will have a new dial type, featuring a map in the center, lining up each city code in coordination with its location on the map. This new dial will only be found on the 2 sports models as shown above. The next 2 styles are going to be a little more dressy in comparison. 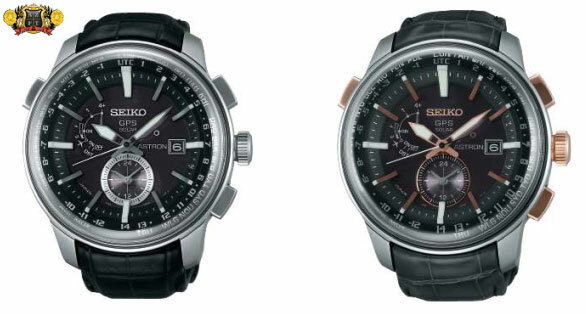 SAST037 (left) will have a stainless steel case with black radial dial (as seen on previous Astron models) and crocodile leather strap retailing for $2,550. The SAST038 (right) will be very similar, but with rose gold plated accents, and slightly lighter gray strap and will retail for $2,600. All 4 of these new styles will have a 48mm wide by 18mm thick case size. While larger than the original release Astron’s, part of the thickness is due to the deeply domed sapphire crystal with anti-reflective coating inside. The new domed crystal requires over 10 hours of polishing in order to achieve its dome. 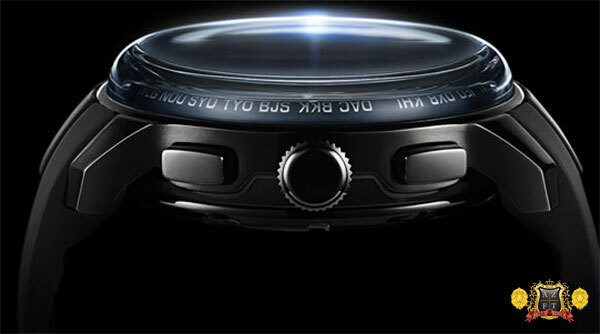 These new styles now have the city codes and difference in UTC inside of the bezel, eliminating the need for ceramics. These new models of Astron GPS are scheduled to deliver in the next month or two. As always, if you have any questions, or wish to pre-order, please call us at 1-800-486-3996 or submit an inquiry through AZFineTime.com. They are also available to pre-order directly on our site HERE. 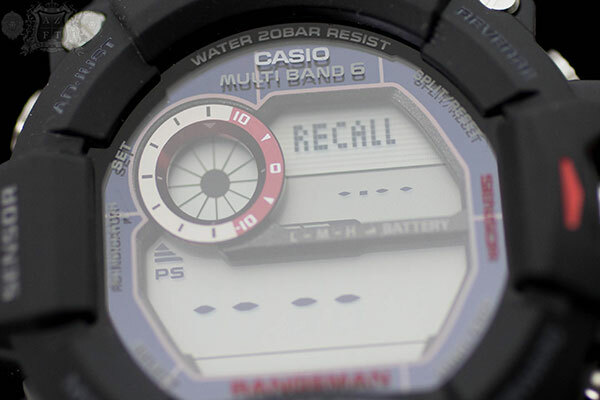 Casio’s launch of the G-Shock Rangeman, without question, was an incredible success. 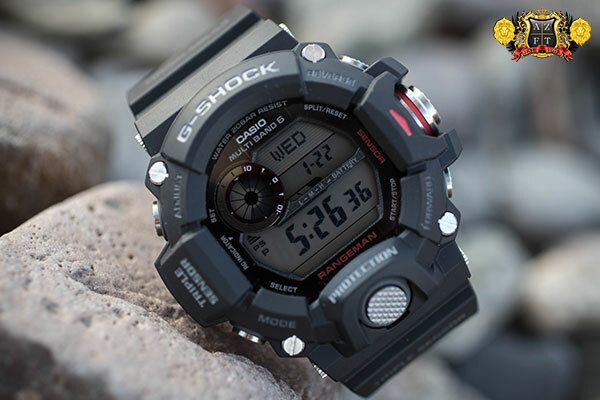 The GW9400 Master of G series is the 1st G-Shock equipped with Casio’s 3rd generation triple sensors (or to use triple sensor in general), in order to display compass bearing, atmospheric pressure/temperature, and altitude. As compared to their 1st triple sensor from 1994, the 3rd generation is not only reduced in size by 95%, but also 90% less power consuming and more accurate. Casio has also used a cylindrical button guard structure for smoother, more precise, and protected button operation and stainless steel button shaft to ensure a more durable performance with frequent use. 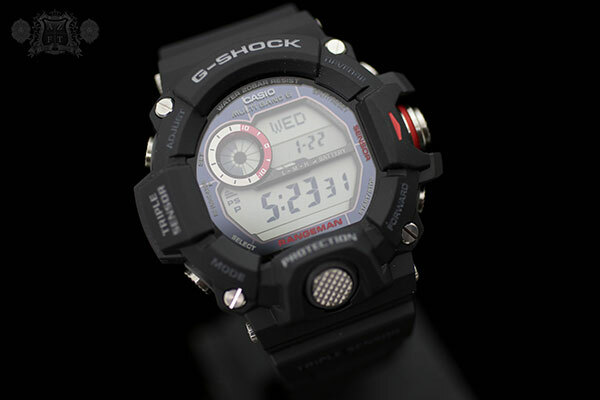 This is now G-Shocks ultimate survival watch. 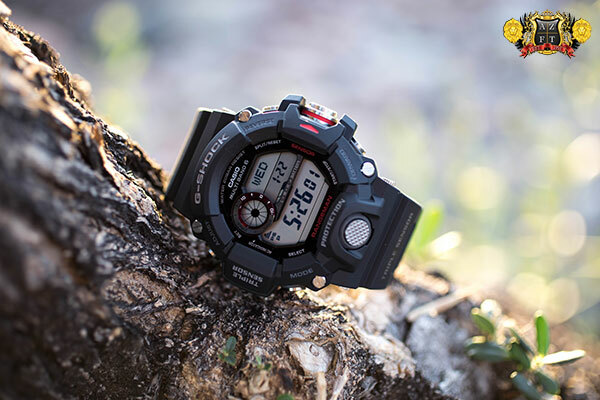 The new Rangeman also has the full on functionality and durability found throughout the G-Shock brand. Shock resistance is of course a must, but it is also mud resistant, low temperature resistant and water resistant to 200m. One of the best parts is that the Rangeman is Tough Solar having a maximum power reserve of 23 months in sleep mode from a full charge, plus Multiband 6 for atomic timekeeping. By pushing the right middle button once you can access the 1st of your 3 different sensors. The 1st sensor is distinguished by a single audible beep and will display your current altitude. The sub dial at 10:00 will be your altitude differential graph, to check the difference between current altitude and a reference point. This gauge will measure the difference in meters. At the top of the screen, you will see the altitude tendency graph (which can be switched to relative altitude by pushing the upper left button), and is updated every time you take a reading. Below that is your current time. On the main portion of the display you will see the altitude read out. 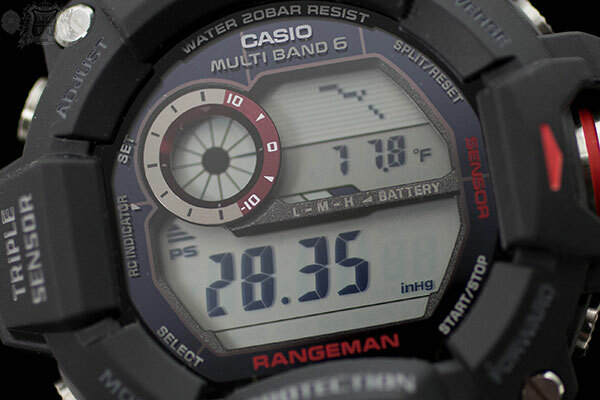 The Rangeman is capable of measuring -2,300 to 32,800 ft. Pushing the middle right button again will bring you to your compass, which is recognized by a double audible beep. It is important to have the watch level in order to get an accurate reading. 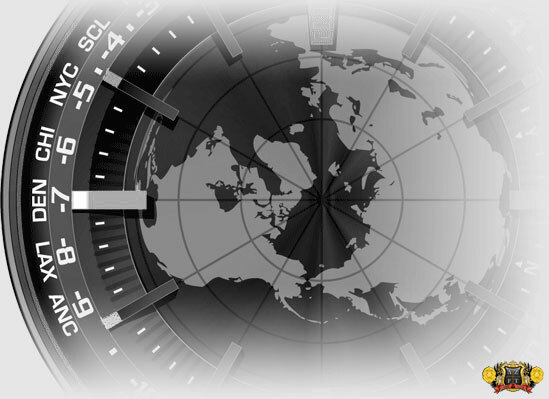 The sub dial at 10:00 will have a a digital indicator that will point North. The top of the screen will display your bearing objective, telling you what direction you are facing from the 12:00 area of the watch. Below that, your current time will be displayed again. The main portion of the screen will display the bearing angle to the objective. This compass can run for 60 seconds as opposed to the 2nd generations 20 second length and uses 1/10th the power in comparison. By pushing the middle right button one more time, you will hear a 3 beep indication which means the watch is now in barometer mode. 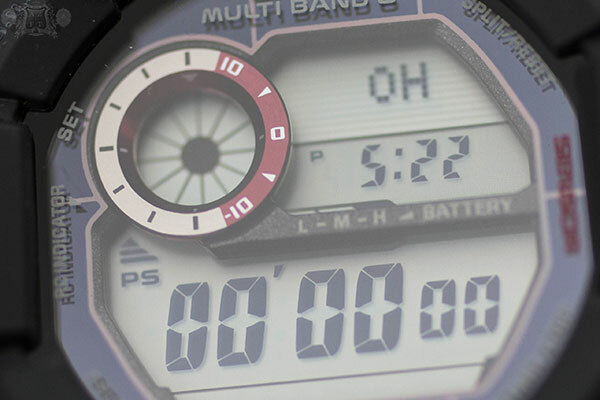 The 10:00 sub dial in this mode will display with a single digital line to indicate differential in barometric pressure. The line in the picture is currently pointing to “0” meaning no change. If it were to move towards the “10” on the red ring, it means an increase in pressure, and towards “-10” a decrease. The top of the screen will display a graph that shows a chronological history of pressure readings. Below that is your current temperature, which is most accurately read when off of your wrist for about 20 minutes, as body temperature will affect it. 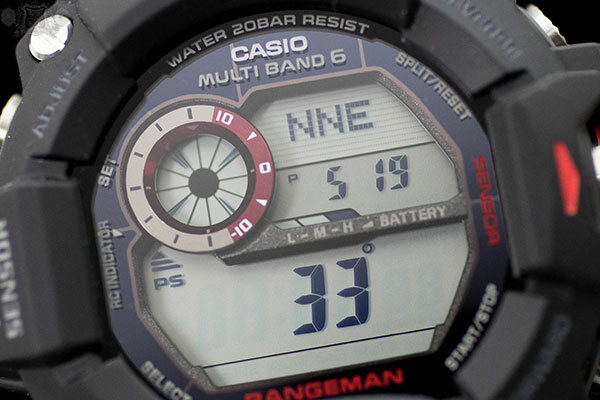 The main portion of the screen displays current barometric pressure in inHg (as pictured). You can adjust all sensor measurements to display in either US or Metric measurements in timekeeping mode by holding down the upper right button for about 3 seconds, using the lower left button to find unit adjustment and use the upper, middle and lower button to change temperature, altitude, and barometer measurements respectfully. Pushing the lower left button will take you out of your sensors and back to timekeeping mode. 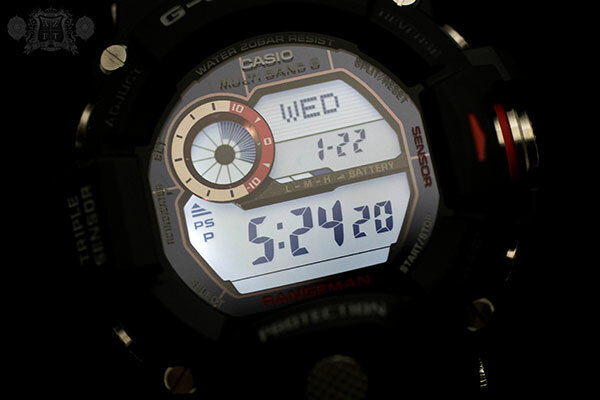 Timekeeping mode displays time, day, date and month as well as AM/PM. 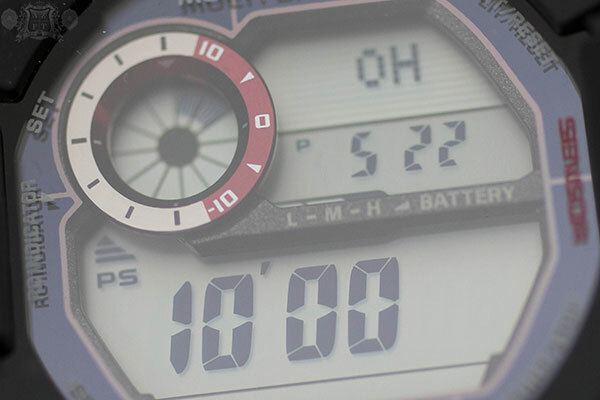 The 10:00 sub dial will act a a second hand unless the stopwatch is in progress or paused. Pushing the lower left button once from timekeeping mode will put in World Time mode. This allows for easy changing of timezones by using the upper and lower right buttons. You will have 48 city codes to choose from to display one of 31 timezones. 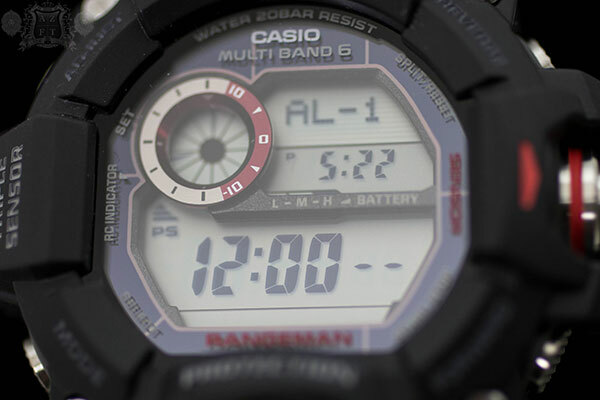 The top of the screen displays the city code, below is your display of home time, and your world time’s display is in the main portion of the screen. Pushing the lower left button again will pull up your stopwatch. Your stopwatch can be started/paused by using the lower right button and reset by using the upper right. This can measure anywhere from 1/100th of a second up to 1,000 hours. Pushing the lower left button again will bring up your countdown timer. The can be set for as low as 1 minute up to 24 hours. Pushing the lower right button will start or pause your timer, the upper right button will reset. Once the timer goes off, 10 audible beeps will sound. The next mode is your alarm. There’s actually 5 of them one of which you can snooze. You can turn the alarms on or off by pushing the upper right button and switch to through your different alarms by pushing the lower right. Setting the alarms is done by holding down the upper left button for about 3 seconds on the alarm you of your choice and using the lower left and upper and lower right to change hours and minutes. Once the alarm sounds, 10 double beeps will sound. You can also set an hourly time signal so the watch will produce 1 double beep, on the hour, every hour. The next mode is an indicator for sunrise and sunset times, based on the set city code and latitude/longitude. You can scroll through and see sunrise/sunset from different dates by using the upper and lower right button. The next mode is your data recall. Basically, you can record up to 40 logs for date/time, bearing, and barometric pressure/temperature records. To record the info, you simply hold down the upper right button for 2-3 seconds in the desired mode you want to record. As I mentioned before, this piece is radio controlled. The final mode will scroll “R/C RECEIVED” along the top of the screen. In this mode you can manually attempt to connect to the signal by holding down the lower right button until “R/C HOLD” appears at the top of the screen. This piece will automatically attempt to receive signal on its own between midnight and 5AM, so the manual receive shouldn’t be necessary. 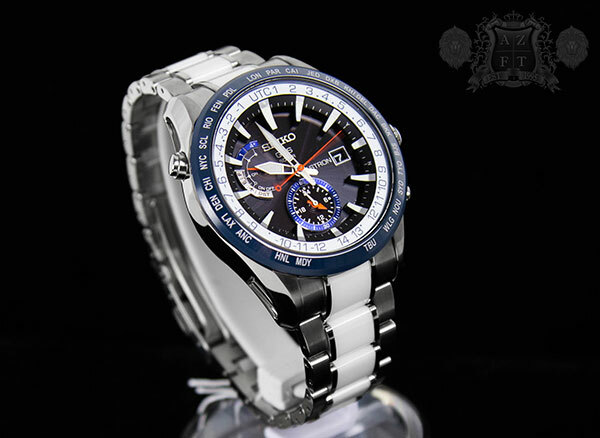 Pictured above is an example of the watches white LED light, that can be set for a duration time of 1 or 3 seconds. The light is activated by pushing the button at the 6:00 area. The Rangeman measures out at 53.5mm wide and 18.2mm thick, which sounds gargantuan, but definitely does not wear that large. While it is still a big watch, these measurements are from the furthest points out, so it is a little deceiving. It is a wide design to help with legibility, which it definitely does, and is also very comfortable to wear as it is only 93g in weight. 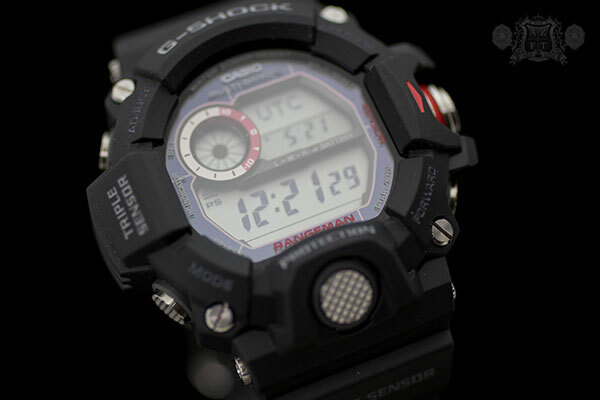 As always and most important, G-Shock’s impressive designs look awesome on the wrist! 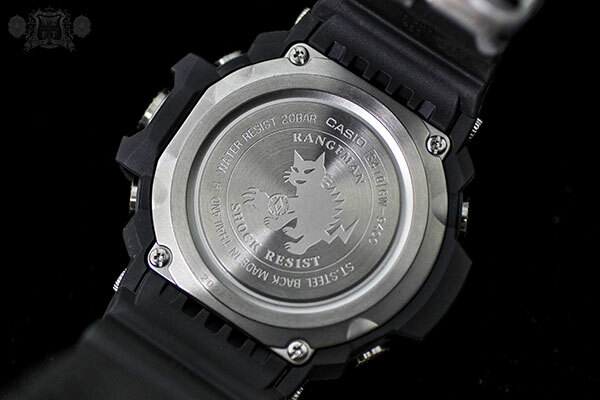 The case back is forged stainless steel with a cool impression of the G-Shock Wild Cat character. 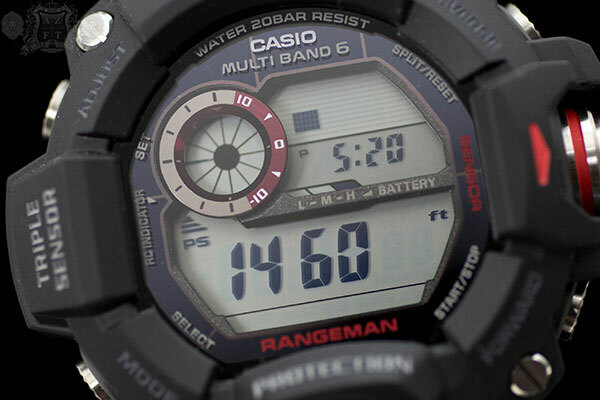 This symbolizes the Rangeman’s unrestricted movement through the wilderness. 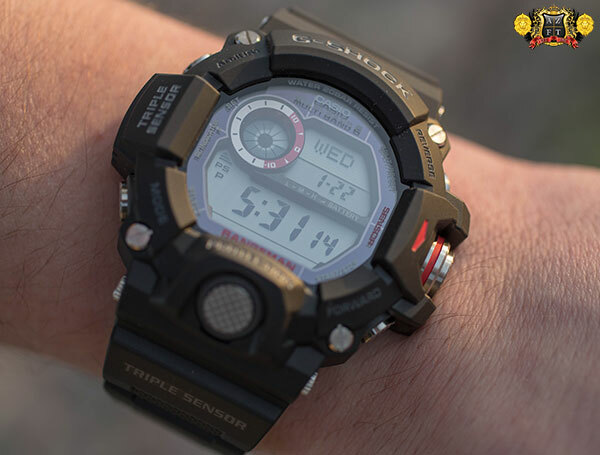 The MSRP on the Casio G-Shock Rangeman GW9400-1 is $300 and can be purchased directly on our site HERE. If you have any questions, please feel free to call us at 1-800-486-3996. 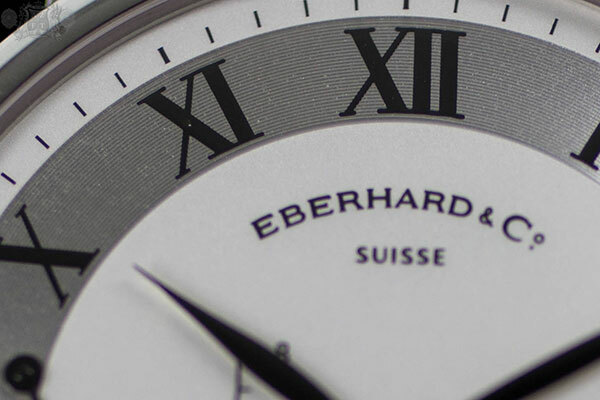 Eberhard & Co. has officially been relaunched here at AZ Fine Time with new distribution, a better supply of inventory, and even more important, new lower retail prices for the consumer. A personal favorite has always been their 8 Jour Grande Taille, not just for its classic and elegant styling, but for incredible mechanics for a much lower price than most of its competitors. The term jour is french for day, obviously translating this piece to 8 day, which is in reference to the timepieces power reserve. 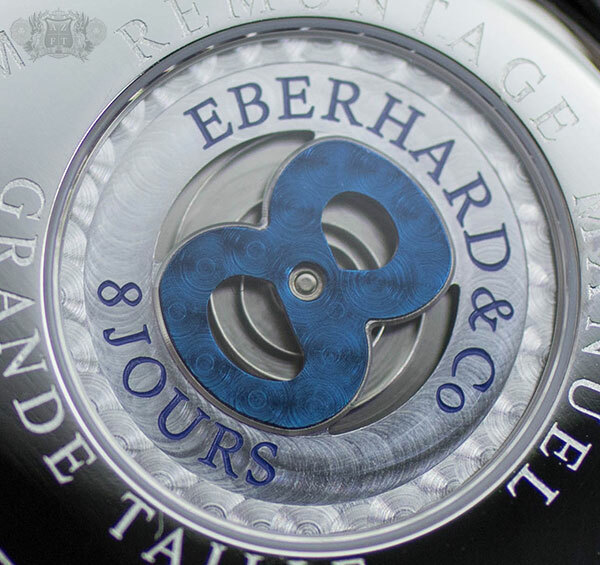 The 8 day power reserve is not a completely unique complication, but the system used by Eberhard & Co. is. Instead of using multiple barrels to achieve its extended power reserve, the 8 Jour utilizes 2 mainsprings overlapping each other. One of the springs is a standard length of 30cm, while the other is an impressive 1.25m (totaling over 5 feet of mainspring). This unique winding system is applied to the manually wound base of a Peseux 7001 (which is a part of ETA) and has a rate of 21,600 bph. The top layer of mainspring is visible through a sapphire crystal porthole, exposing a perlage coated, blue “8” shaped bridge and has the mainspring visible underneath. It is definitely intriguing to see the mainspring tighten as you wind up this piece, but the detail itself is very well done. All this adds up to create the E&Co. 896 movement. The 41mm case is in stainless steel (but does also come in 18k gold), and has a classy high polish finish all the way around. The crown is fairly large, but not obnoxious. 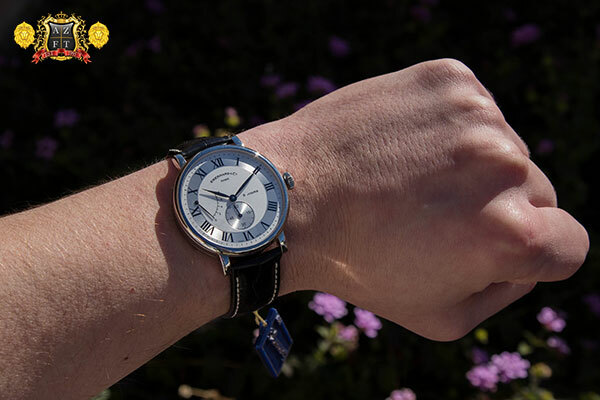 While it does not dig into the wrist when worn, it is still easy to wind which is great because to reach a full 8 day power reserve, does take more than the average amount of winding. The strap is a 19mm black crocodile leather with white accent stitching that only goes about half way down the strap. The clasp is a nicely sculpted tang buckle, but deployment is optional. 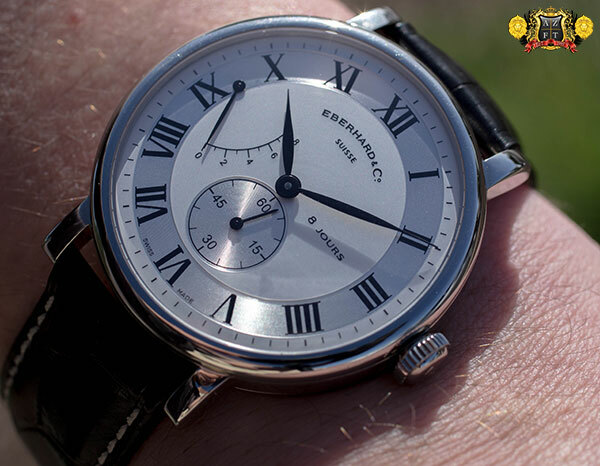 The dial design is very well executed and has a pocket watch type look. 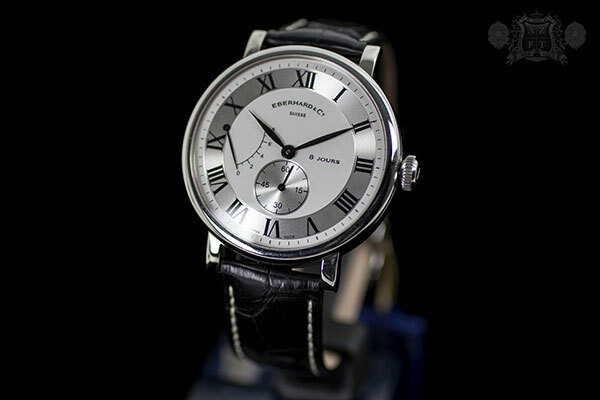 The roman numerals are painted on a silver embossed ring, while the rest of the dial is a matte white. 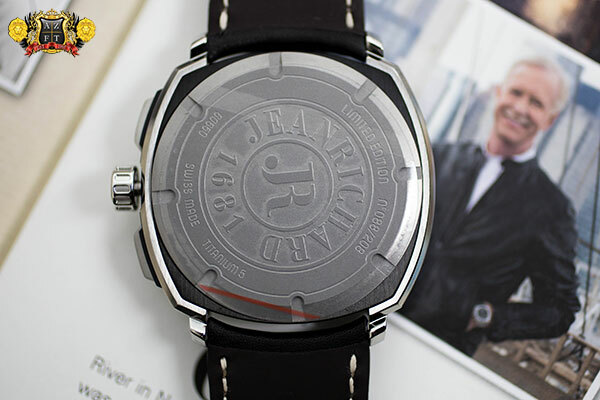 The hands are a black feuille shape and contrast the dial very well making for great legibility. You will find your power reserve indicator at 9:00-10:00, which measures in days opposed to hours, and your small seconds counter at the sub dial at 6:00. The details of the dial are subtle. The silver rings embossing is something that cannot be determined from many photos, but add a very nice detail to accent the white. 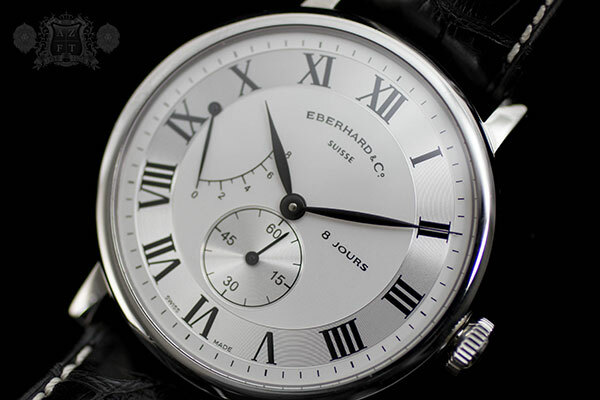 The dial is protected by a slightly curved sapphire crystal and contributes to the 8 Jours soft round design. 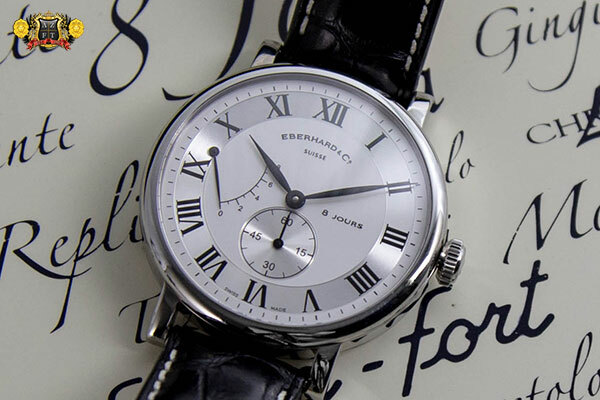 The new MSRP of the Eberhard & Co. 8 Jours Grande Taille 21027.2 is $4,950. This is about 12% lower than its previous MSRP, and still substantially less than most others . As always, if you have any questions, please feel free to call us at 1-800-486-3996 or submit an inquiry through AZFineTime.com. 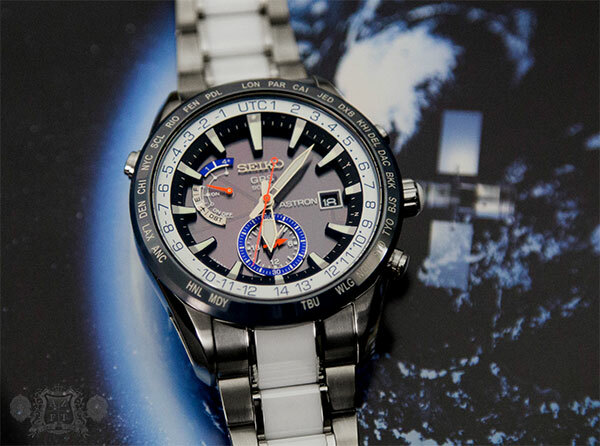 At the end of 2013, Seiko launched a new variation of their Astron GPS Solar in limited edition form. With only 1,200 models produced for the world, the new SAST029 features a unique color combo for the series, with white ceramic center links, white ceramic jeweled crown, as well as a blue ceramic bezel. The SAST029 also has some other traits never before seen in the Astron line up. The orange accents for the seconds, mode, and the home time sub dials hour hand make for a great “pop” on the dial. There are also blue metallic highlights on the mode indicators satellite connection section, and around the 6:00 sub dial. 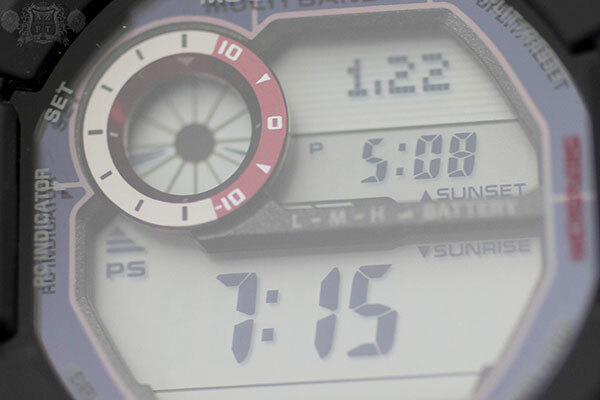 The dial also has the newer, larger hands (which can be seen on the SAST100 LE), making for easier visibility at night than previous models. In the image above, you can see the radial sunburst pattern on the translucent black dial that lays above the watches solar panel. 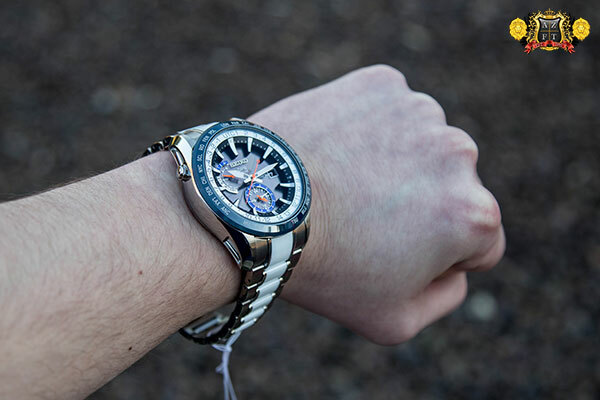 This new LE has a titanium case and bracelet, with the collapsed case sides found on models SAST015. Not quite as elaborate as the SAST100, but still have a greatly detailed aspect to them. 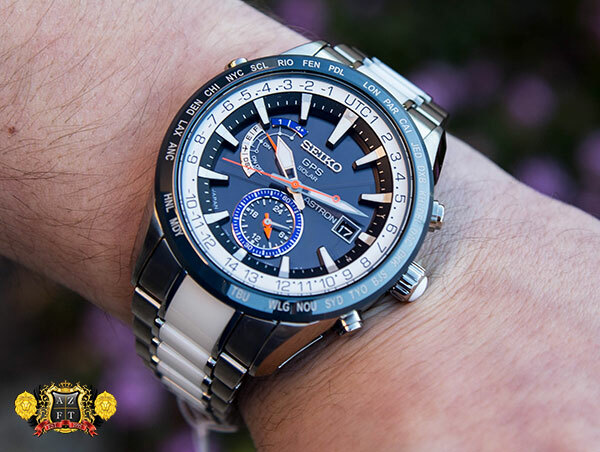 Seiko’s proprietary “Bright” titanium allows the 47mm wide, 16.5mm thick timepiece to weigh in at only 141g, which amazes most everyone when they put the piece on their wrist. As I mentioned before, the orange accents really make the SAST029 stand out, but what really makes a difference is the home time’s orange hour hand. This makes its small independent 24 hour hand really easy to read. Another nice touch is the watches chapter ring with difference from UTC in white with blue numerals and its ceramic bezel in blue, with white text for the city codes. I can easily say, this is the most legible Astron GPS to date. This, as well as every Astron GPS, features the 7X52 movement with over 10 years of development and over 100 patents. The 7X52 is the only movement capable of connecting to multiple GPS satellites, pin point your location, and update the hands all by holding the upper right button for about 6 seconds. This piece can also connect to 1 satellite to update its second hand accuracy by holding the upper right button for 3 seconds, or will automatically do so with exposure to bright sunlight. The piece is also solar powered, with a maximum power reserve of 2 years in sleep mode. Designed with a sporty look, inspired by sailing the sea, the SAST029 can recognize what timezone you are standing in (out of all 39), even if on a boat in the middle of the ocean. 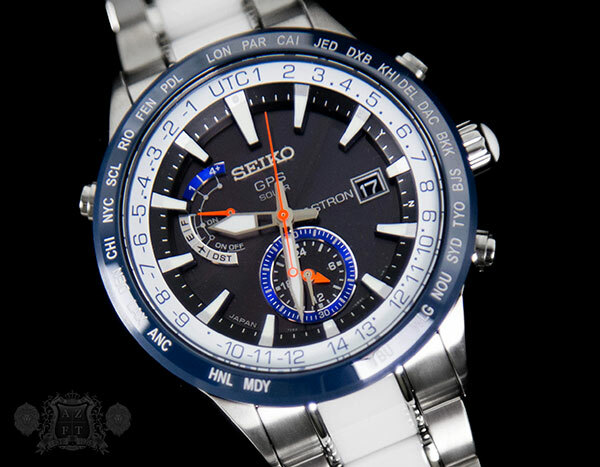 The MSRP on the Seiko Astron GPS Solar Limited Edition SAST029 is $2,900 and can be purchased directly from our website here. If you have any questions, please feel free to call us at 1-800-486-3996 or submit an inquiry through AZFinetime.com. Today marks the 5 year anniversary of US Airways Flight 1549, when Captain Chesley Sully Sullenberger heroically landed the commercial passenger flight on the Hudson River, saving 155 lives, all in 208 seconds. 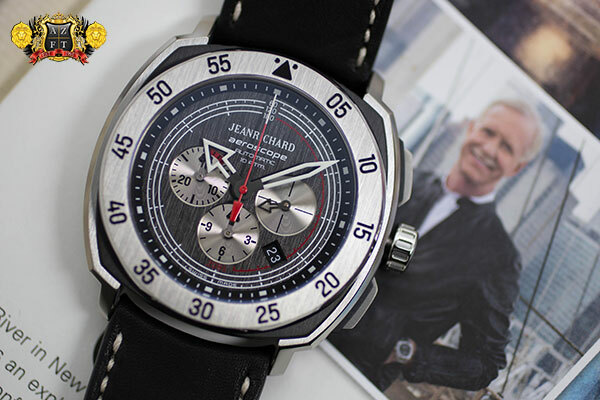 In honor of this courageous feat, “The Miracle on the Hudson”, JeanRichard has officially launched the new Limited Edition Aeroscope labeled, “208 Seconds” to honor their brand ambassador, Captain Sullenberger. The new limited edition Aeroscope will feature a 44mm titanium cushion shaped case with a DLC inner case, and silver toned titanium inserts for the case sides. The dial will be a vertical satin back with accents for the total of 208 seconds highlighted in red. 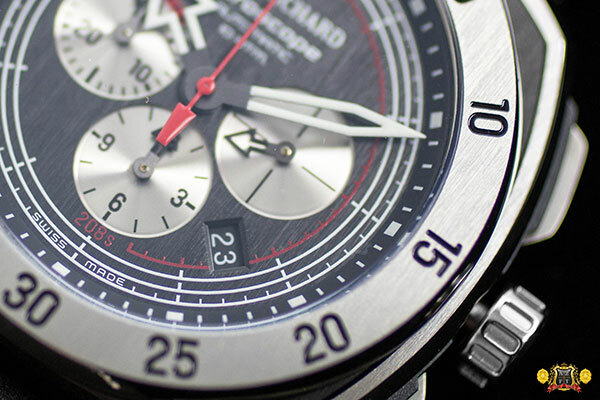 The first 3 minutes on the chronograph minute counter, and the remaining 28 seconds near the outer edge of the dial. It is indeed very impressive to see this commemorative LE for such an iconic hero. Last night at the launch event for the “208 Seconds”, JeanRichard also hosted a tweet chat, allowing people to submit their questions to the Captain using the hatch-tag #208seconds . A great opportunity to ask questions about the landing itself, or his outlook on life after the event had occurred. 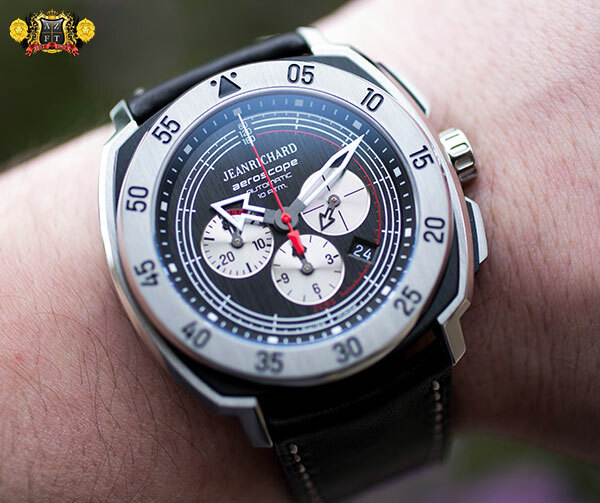 The MSRP on the JeanRichard Aeroscope 208 Seconds Limited Edition is set at $5,400 and is available for order at AZ Fine Time. 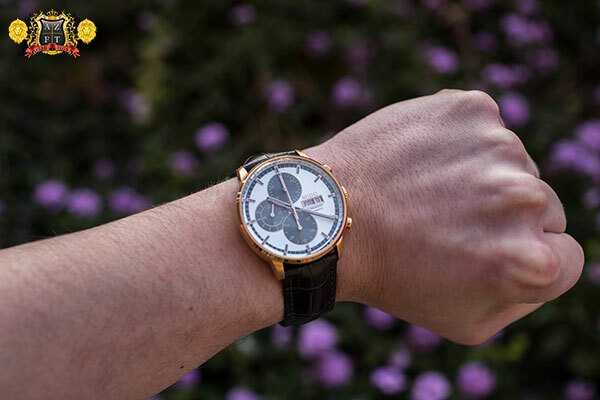 Part of the proceeds from the timepiece will go to The American Red Cross and The Rory Staunton Foundation. 208 seconds made Captain Sullenberger a hero and the watch’s automatic chronograph movement perfectly embodies the spirit and respect that the Captain and JEANRICHARD have for time. 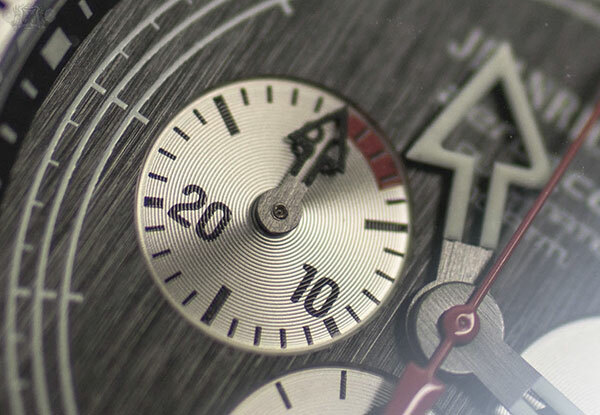 The 208 seconds are represented by a subtle marked white and red timeline on the timepiece’s black dial. 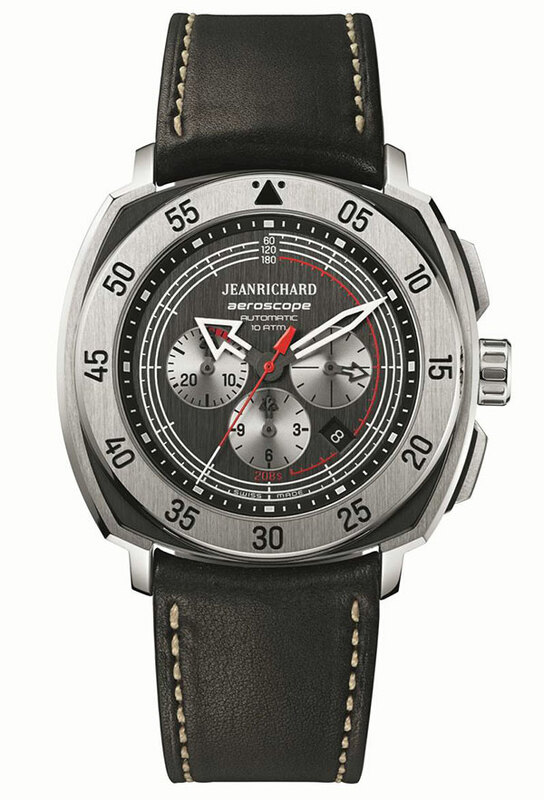 Available on a black Barenia® calfskin strap, the JEANRICHARD “208 Seconds” Aeroscope is a re-interpretation of the old aviators’ watches, and with its titanium cushion-shaped case shares a man’s most enduring dream with style. 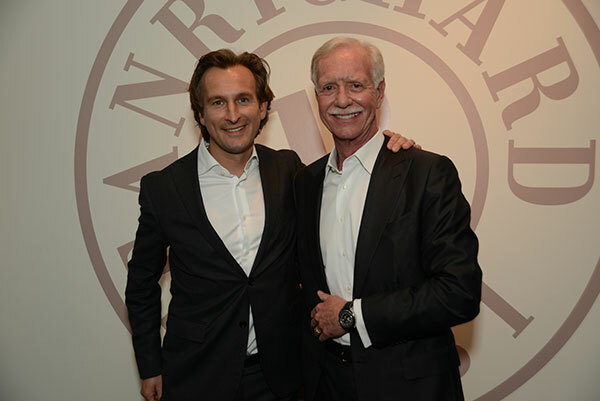 Part of the proceeds of the watch will go to The American Red Cross and The Rory Staunton Foundation, two of Captain Sullenberger’s philanthropic endeavors. Throughout the event guests also participated in a social media challenge, where they were tasked to take a wrist shot of the new “208 Seconds” Aeroscope and post it to their Instagram account. The “Best Shot” will be re-grammed today, January 15th, through the brand’s Instagram account (@JRwatches). The winner will receive a “208 Seconds” Aeroscope watch.